An anti barking device is an important tool that can help you alleviate the noise that comes along with having a dog. It isn’t always the dog’s fault they bark. Sometimes, even after formal dog training, your dog may be prone to bark when someone knocks on the door, when the mailman delivers the post, or when you are away from home. 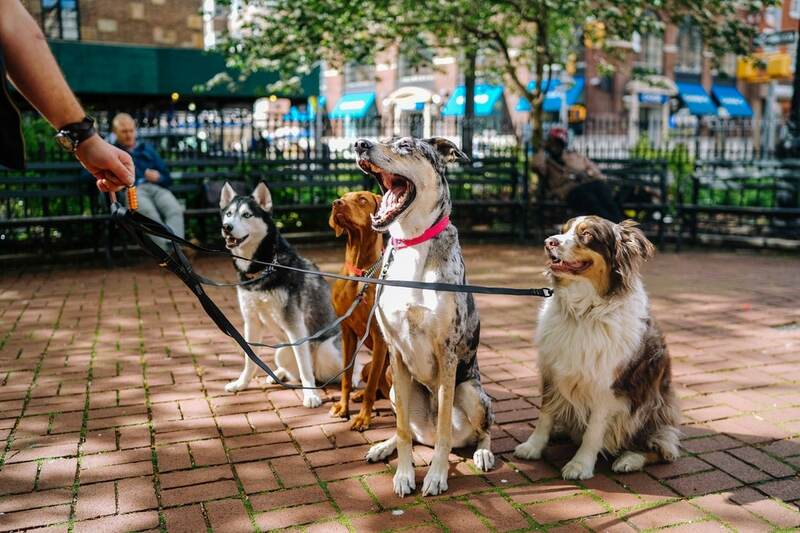 While we recognize that barking is one of our pets only tools for communications, it is important for your sake (and sometimes that of your neighbors) to ensure your dog is kept quiet by utilizing anti barking devices. When it comes to bark control devices, there isn’t a one size fits all answer for the best products to stop dog barking. This is why we’ve put together a comprehensive list of the best stop dog barking device reviews for you to choose which solution will work best for you and your individual dog. Manufactured by POP VIEW, this bark collar operates using a shock-free technique. The collar is designed for people who yearn to ease their dog’s barking without harm. The product features 7 sensitivity levels you can train your pet. 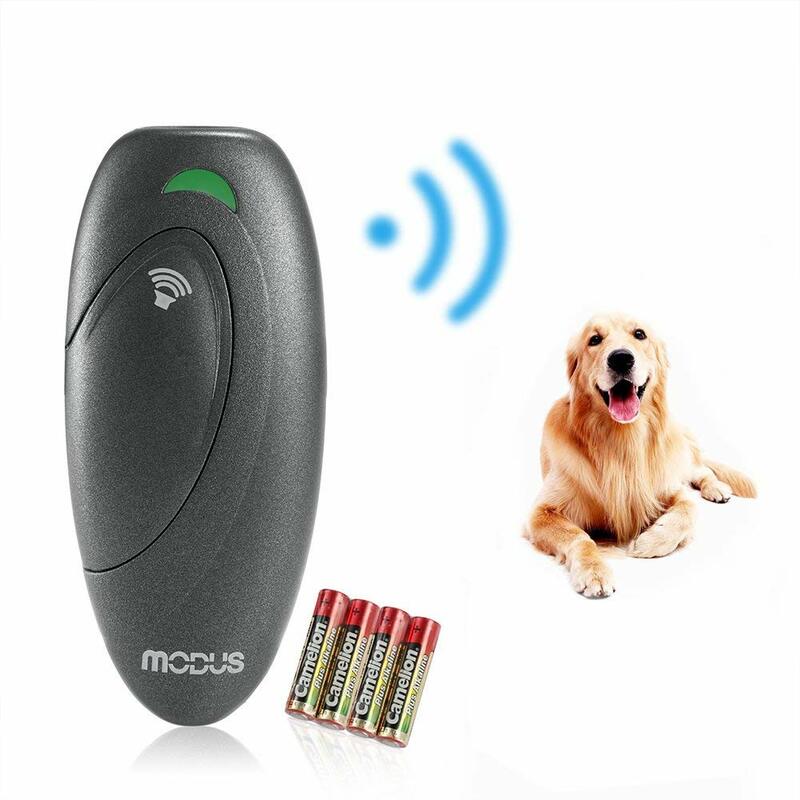 The device detects when your dog barks and produces a beeping sound. If barking persists, the collar vibrates and no shock waves are emitted. Constructed with waterproof nylon, the collar is resistant rain and snow. The collar’s size is adjustable which makes it compatible for neck sizes 7 to 21 inches. In addition, the collar is built with seven correction levels you can adjust depending on your dog’s sensitivity. 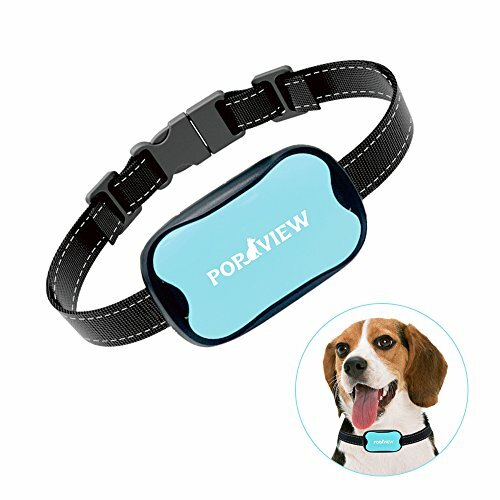 The POP VIEW bark collar has potential, however, it certainly doesn’t work for every dog. Certain dogs are extremely sensitive beyond the seven correction levels. This portable bark control device from First Alert, uses ultrasonic waves to keep dogs from barking. You can use it anywhere you bring your dog. The device produces an ultrasound only your dog will hear to discourage barking. The device can be used for all breeds and works up to 15 feet. It can also be carried with an adjustable wrist strap. The First Alert sounds like a decent device. However, it’s recommended to add a correction level adjustment feature to assess sensitivity. Designed with high-quality, waterproof nylon fabric, the DogRook dog bark collar is for all breeds from 11 lbs and up. Its advanced technology helps train your dog not to bark without using shock waves. The strap is adjustable for necks within range of 9 to 22 inches. 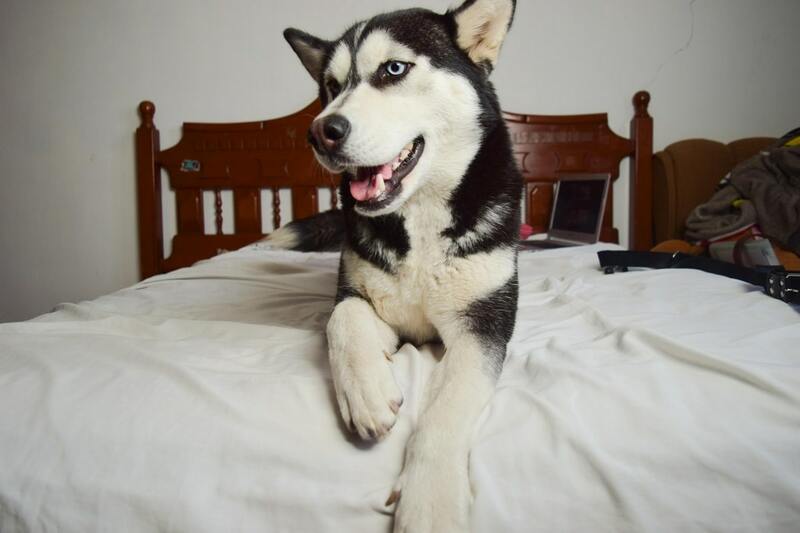 In addition, the collar offers 7 adjustable sensitivity levels you can customize for your dog. Judging by the reviews, this one is worth trying out. 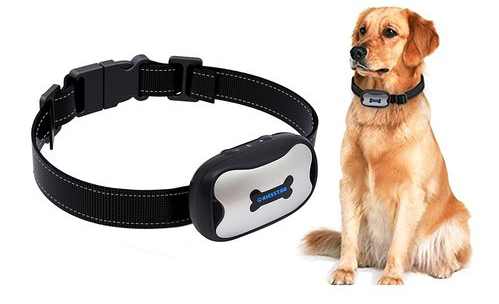 This bark collar from GoodBoy, is used with small and medium-sized dogs. It doesn’t use shock waves but vocal sensors with seven adjustable correction levels. The device will buzz when it detects movement in your pet’s vocal chords. The collar can be adjusted to fit around necks from 5 to 19 inches. It is also rechargeable, coming with a USB charging cable. Ideal for small and medium-sized dogs. If you prefer a rechargeable bark collar, you can consider this option. 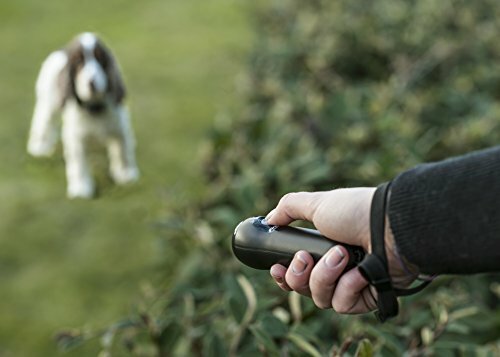 With the Vicvol mini bark control device, you don’t use a collar. It’s a waterproof mini controller that produces ultrasonic waves with three ranges. You operate the controller using four buttons and one to test it and three for levels. The device is effective up to 50 feet away. It allows you to save energy using 9-Volt batteries for power. These batteries can last 5 to 6 months. You can consider this option if you prefer an anti-barking device without a collar. 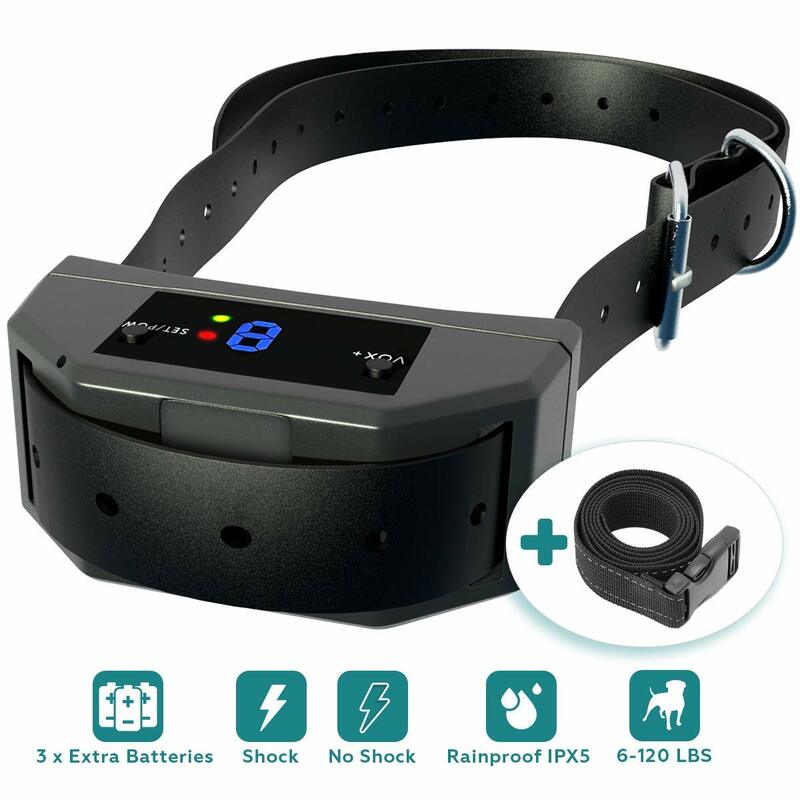 The Best Industries’s dog bark collar features an advanced automatic system which a series of modes activate when your dog barks. Unlike other devices, this bark collar incorporates shock along with beeping and vibration into its mechanism. The collar is constructed with waterproof material, making it suitable for wet days. Plus, it features 5 adjustable correction levels, two training modes, and a digital screen for viewing. If you’re someone whose open to shock collars, then this might be a good choice for you. Petacc is on top of the game with this intelligently-designed bark control device. As the title indicates, the device produces ultrasonic waves to lessen unnecessary barking. With the push of a button, ultrasound waves are released and your pet detects them right away. Only heard by dogs, the sound waves are safe and may spread up to 17 feet. When battery life is low, the indicator LED light will show red. Judging by its features, this bark collar has potential to be a good product. Electric shock controllers, also known as shock collars, are the most popular and well known dog silencers and are a great option if you have dogs with different sensitivity levels. Most collars are intuitive enough to ramp up the voltage of the shock given if the dog continues barking, ensuring it always uses the gentlest setting possible to have the desired effect of quieting the dog. 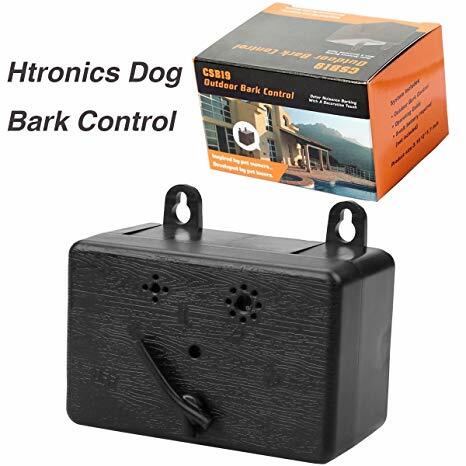 Similar to the ultrasonic exterior bark controllers, sound sensitive bark controllers are built to detect noise and emit an ultrasonic noise to deter your dog from continuous barking or growling. These have a range of 50 feet but they do vary a bit in mounting styles, as they are recommended to be mounted no higher than five feet, which makes them perfect for setting on top of a porch railing or a kitchen countertop. Vibration collars are a great choice if your dog is very sensitive. These will detect if the dog is growling or vocalizing and deliver a gentle vibration against the dogs neck. Over time, the dog will associate barking with the vibration it receives as a correction, and will cease barking while wearing the collar. It is important to have them wear it at all times, as some dogs will start to recognize when the collar is on or off, and will bark more when they aren’t wearing it. If you need outdoor dog bark control, or a more long range dog barking deterrent – for example, if you have unruly neighbors who refuse to teach their dogs not to bark, a sound sensitive bark system would be a great option for you to utilize. These are triggered by sounds above a certain decibel. Once triggered, they emit an ultrasonic noise that only dogs can hear. They are waterproof, birdhouse shaped and battery operated, and can be mounted to any post, tree branch or fence. Lemon spray dog noise suppressors are a relatively new product in the market over the last few years but have been gaining traction with dog owners. The spray varies in ingredients from citronella, lemon spray, or water, but the concept is the same across all types. The dog wears a collar with a small canister attached that is triggered to spray when the dog barks. If the ingredients are simply water, the sound of the spray will startle the dog, causing the barking to stop. However, if water alone isn’t enough to get your pooch to be quiet, you can purchase refillable lemon or citronella canisters. These ingredients are completely harmless to your pet, but will slightly irritate their very sensitive olfactory sense of smell. The sensation is unpleasant enough that the dog will learn to stop barking. Now that you have learned the range of products available for the best dog bark control and anti-barking devices, it’s time to look at the different benefits of each to decide which would work best for you and your pet. To determine your required effective range, ask yourself: do you need to silence your own dogs, or your neighbors? If it is for you, and you only have one dog, a collar may be the way to go. If it is for your neighbor (or multiple neighbors), it is a lot easier to quiet their dogs by using a long range bark deterrent such as an ultrasonic device since you can install it in your yard without having to consult them. These outdoor dog barking deterrents should be mounted facing the dogs of interest, and have a range of fifty feet so keep that in mind during installation. Every dog has its own sensitivity levels, which is why it is important to consider your individual dog’s needs when selecting dog no bark devices. A sound sensitive in-house device would be the best budget friendly bark deterrent for small dogs; however, one dog might respond better to a vibration collar and another dog may respond better to a shock collar that ramps up in intensity each time the dog vocalizes. If you have a particularly stubborn dog, it might help to buy a collar that comes with a remote control. That way, you can issue a correction to your dog by pushing a button as well as letting the collar help correct the dog as well. All these products are designed to help cut down on the noise owning dogs can create. Regardless of which product you select, make sure it is easy for you and your family to use. The instructions should be easy to read and follow, and the battery should be easy to access and replace. All collars should fit properly and snug enough for correction to work. Now that your dog is quiet, you’re probably noticing one more noise – the jangle of their name tags hitting against each other. You can solve this problem by buying tag silencers, which are little rubber protectors that fit around tags and give them a buffer from hitting each other. We hope this product guide has helped you determine what the best dog barking deterrent is for your situation. Now that we’ve reviewed for our top picks, let’s discuss a few things in the Q/A section. In this section, we address several frequently asked questions concerning bark control devices. Feel free to ask any additional questions in the comment section below. Do ultrasonic bark deterrents work? Ultrasonic bark deterrents work using advanced technology. You have to remember, every dog is different so results will vary. Plus, all ultrasonic bark deterrents aren’t built with the same mechanisms. We recommend trying out multiple products to identify what works best. 2. How do I shut up my neighbor’s dog? You can address the issue with your neighbor directly. If willing, you can advise your neighbor consider purchasing an anti-barking device. If they decide not, respect their decision and try to compromise on how the issue can be resolved. Out of the choices, we have to choose the DogRook bark collar as the best dog barking deterrent. 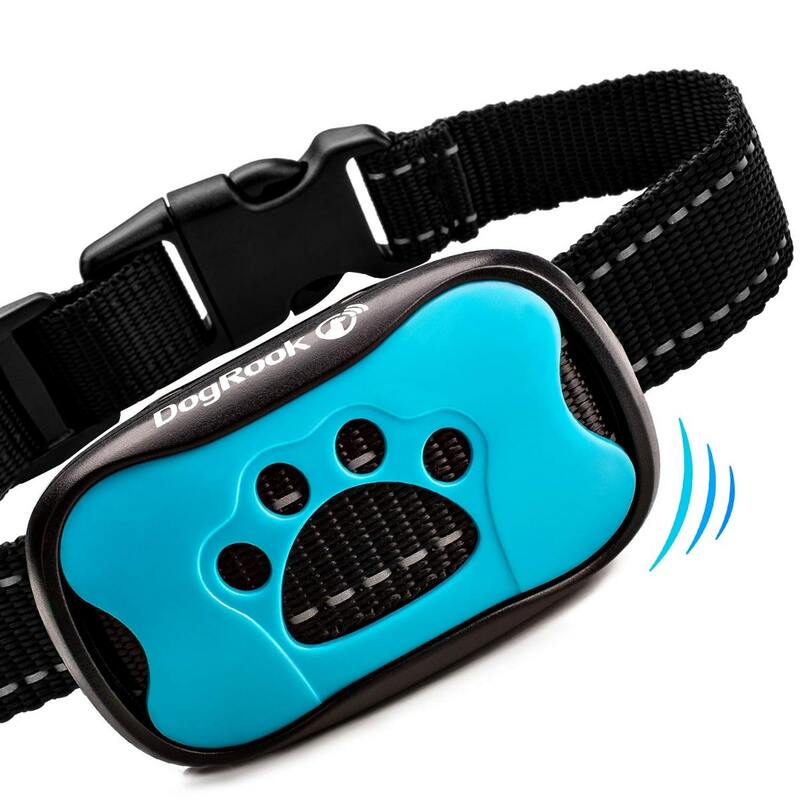 Being aware that many consumers aren’t fond of shock collars, we recommend the DogRook as it is shock-free. It’s perfectly adjustable and made with high-quality materials that can withstand rain.